Briefly, a transceiver can be defined as a device that comprises of both a transmitter and a receiver of analog or digital signals. For example, radios and telephones are some of the devices that use transceivers. Network transceivers are used in specific networks like LAN to transmit signals. Lots of people tend to confuse transceivers and transponders. In fact, they have the difference; a transceiver transmits and receives signals anytime while a transponder only responds to an incoming signal or command. Transceivers come in three configurations: the chip, board and module style. The chip style is portable and the smallest optical transceiver available. The board Style unlike the chip style is in-built in the network system making it permanent while the module Styles are stand-alone devices as they are not directly installed in the network system. Fiber optic transceivers operate in three modes of channels; the simplex, half-duplex, and full-duplex modes. 1. The Simplex mode: This mode of channel operation is one way. It does not send back error information. Since it is one way, its use is phasing out and today it is mainly used in radios. 2. Half-duplex mode: This can only handle a single signal at a time. That is; it can only transmit or receive a signal at a time. Not both. 3. Full-duplex mode: A full-duplex transceiver can handle the reception and transmission of all signals at once. One thing to note though is that the transmitter and receiver need to work on different frequencies in order to avoid collisions between transmitted and reception signals. GBIC: GBIC (Gigabit Interface Converter) is the media conversion device that connects Gigabit network equipment and fiber optic networks. By use of a GBIC transceiver, Gigabit network equipment can connect to single mode ports, multimode fiber ports and even copper wires. GBIC is also hot pluggable which enables connection modifications. SFP: SFP in full is Small Form- factor Pluggable. They are also referred to as mini GBIC due to their similarity in function to the GBIC transceivers though smaller in size. SFP transceivers are mainly used to link equipment in telecom and data communications like switches and routers. They support applications like Fiber-to-the-desktop (FTTD), SONET/SDH Network, Gigabit Ethernet, and High-speed computer links among others. SFP Plus (SFP+): These are an upgraded version of the SFP. The only difference is that they can support up to 10Gbps data rates and are smaller than the 10Gbps X2 and Xenpak transceivers. XFP: These are protocol independent optical media conversion equipment used in the SONET/SDH Network, 10G Ethernet and Fiber channel applications. XFP transceivers are currently the cheapest and the smallest transceivers. 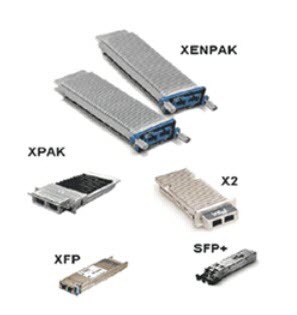 XENPAK: These transceivers support all optical transceiver ports defined in the IEEE 802.3ae. Covering up to 10Km via a G652 multimode fiber he Xenpak transceivers come in three types which include; Xenpak 10GB SR, Xenpak 10GB LR and the 40km Xenpak 10 GP ER. X2: These function exactly like the Xenpak because they were built on the Xenpak standards. These optical transceivers?10G Ethernet standards were defined by IEEE in 2002. Cisco Transceiver Modules support Ethernet, Sonet/SDH and Fibre Channel applications across all Cisco switching and routing platforms. Cisco pluggable transceivers offer a convenient and cost effective solution for the adoption in data center, campus, metropolitan area access and ring networks, and storage area networks. Cisco portfolio of hot pluggable interfaces offers a rich set of choices in terms of speeds, protocols, reaches and supported transmission media. Cisco offers a range of 40 Gigabit Ethernet interfaces that meet connectivity requirements for high-performance computing, cloud services, and aggregation layers. Quad Small Form-Factor Pluggable (QSFP) Bi-Directional (BiDi) Transceiver Helps Accelerate 40 GE Adoption: The new Cisco QSFP BiDi transceiver currently offers the industry’s most cost-effective solution for 40-Gigabit connectivity. By transmitting full-duplex 40 Gigabit Ethernet over one duplex multi-mode fiber (MMF), it can enable seamless 10 to 40 GE migration over your 10 GE fiber infrastructure. QSFP+ Options for High-Density 40 GE Connectivity: With the development of the SFF-8436 Multi Source Agreement, Cisco now offers a variety of IEEE- and MSA-compliant Quad Small Form-Factor Pluggable Plus (QSFP+) devices for copper and fiber networks. The Cisco 40GBASE QSFP+ devices help enable connectivity between server access, top-of-rack, and end-of-row switches deployed in high-performance computing networks. CFP 40 Gigabit Ethernet Transceiver Modules: See the variety of choices available with the Cisco 40GBASE and OTU-3 C Form-Factor Pluggable (CFP) modules. These devices enable connectivity in the distribution and core layers of data center, enterprise, and service provider networks. Cisco offers a broad range of Industry compliant Xenpak, X2 and XFP modules for 10 Gigabit Ethernet deployments. Xenpaks are supported on Cisco routers and some Catalyst switches. The small formfactor X2s are supported on the Cisco Catalyst Switches. XFPs are supported on Cisco routers with Shared Port Adapter (SPA).They provide customers a dual-rate interface for 10 Gigabit Ethernet and Packet-over-SONET/SDH (POS) connectivity. Cisco currently supports many different port types where each one is optimized for the reach and transmission media demanded by a particular 10 Gigabit application. Cisco Coarse Wave Division Multiplexing (CWDM) Solution allows scalable and easy-to-deploy Gigabit Ethernet (GbE) and Fibre Channel services. The combination of CWDM GBICs and CWDM SFPs and CWDM Optical Add-Drop Modules (OADMs) and Multiplexers enables the design of a flexible and highly available multiservice network. The Cisco CWDM Solution offers a convenient and cost-effective solution for the adoption of optical Gigabit Ethernet in campus, data center, and metropolitan-area access networks. Cisco CWDM Solution consists of a set of eight different Cisco CWDM GBICs (one for each of the eight different colors or wavelengths), 8 different SFPs, a set of 8 single wavelength/dual channel OADMs, two 4 channels OADM/MUX and an 8 channel MUX along with a CWDM rack mountable chassis. The Cisco Dense Wave Division Multiplexing (DWDM) Xenpaks allow to integrate WDM transport directly with Cisco 10 Gigabit Ethernet switches and routers. The DWDM Xenpaks (GBICs) and DWDM optical filter and amplifier products (Cisco ONS15216 Series) enable the design of a flexible and highly available multi-service network. The DWDM Xenpaks support 100GHZ ITU grid and match 4-skip-1 channel plan of Cisco ONS 100GHZ products. The DWDM XENPAKs can be used for un-amplified and amplified designs to transmit upto 320 Gigabit over the same pair of SMF. The Cisco Dense Wave Division Multiplexing (DWDM) GBICs allow to integrate WDM transport directly with Cisco Gigabit Ethernet switches and routers. Just like DWDM Xenpak, the DWDM GBICs interoperate with the same ONS equipment. They can be used for un-amplified and amplified designs to transmit upto 32 Gigabit over the same pair of SMF. 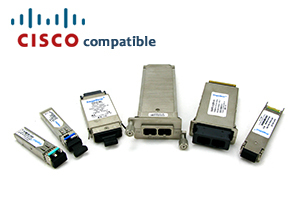 Cisco offers a range of Fast Ethernet SFP Interface Converters. The product portfolio includes 100BASE-FX, 100BASE-LX, and 100BASE-BX SFPs. 100BASE-BX: SFP operates on ordinary single-mode SINGLE STRAND fiber optic link spans of up to 10km in length. A pair of a 100BASE-BX-D and a 100BASE-BX-U SFP is needed for the single strand deployment. 100M SFP for Fast Ethernet (FE) SFP Port. The SFP product name contains a “FE”. 100M SFP for Gigabit Ethernet (GE) SFP Port. The SFP product name contains a “GE”. Cisco offers a range of GBIC transceivers and Small Form-factor Pluggables (SFP) transceivers for Gigabit Ethernet and Fibre Channel applications. These small, modular optical interface transceivers offer a convenient and cost effective solution for the adoption of Gigabit Ethernet and Fibre Channel in data center, campus, metropolitan area access and ring networks, and storage area networks. Cisco offers a range of SONET/SDH SFPs. Products include OC3/ STM-1, OC12/STM-4, and OC48/ STM-16 SFPs for multimode, short reach, intermediate reach, long reach (40km), and long rach (80m) applications.